A common transmission tariff without a wholesale market: A common (single) transmission tariff consists of multiple transmission zones. Under a zonal design, the customers pay the transmission rate for the zone in which their loads are located and do not incur additional transmission charges for transporting energy across other zones in the footprint. Regional Transmission Organization (RTO) membership: Based on the results of extensive evaluations, MWTG has decided to focus its attention on full membership with Southwest Power Pool (SPP), noting that it would provide opportunities to (a) reduce customer costs and (b) optimize use of both resources and the grid in general. Click here for more details. Bilateral Market (status quo) – A representation of the status quo in the Mountain West footprint and the entire WECC region. Joint Transmission Tariff – A single transmission tariff for the Mountain West footprint. Regional Market – A centralized regional wholesale power market covering the service areas of the Mountain West entities. Regional Market with must-run – Assumes that specific baseload units within the Mountain West will continue to operate on a must-run basis even in a regional market environment. This range represents a reduction in production costs of 5.7% to 9.4%. The low end of this range assumes that specific baseload units within the Mountain West will continue to operate on a must-run basis even in a regional market environment. The high end of the range assumes that all baseload units will be fully dispatched by the market (which would likely require more flexible fuel supply arrangements). Overall, the Mountain West group would experience a reduction in production costs of $14 million/year, or 1.5% of total production costs, solely by implementing a joint transmission tariff. MWTG also engaged The Glarus Group to evaluate the benefits of using four DC interties that separate MWTG and SPP to schedule power as a part of the SPP market. Four of the seven DC ties in the U.S. that connect the Eastern and Western Interconnections are owned and operated by Mountain West participants and the combined transfer capability of the Rapid City, Stegall, Sidney, and Lamar ties is 720 megawatts (MW). The study compared the current scheduling process to an alternative process of optimizing scheduled DC tie flows through the market. Additionally, the report considered six scenarios to evaluate benefits under various conditions, specifically: low and high gas prices; low and high load; and low and high DC tie availability. 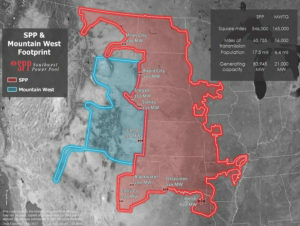 The results of the The Glarus Group study show that, if the combined Mountain West-SPP market optimized the scheduling of the DC ties, both Mountain West and SPP would see benefits ranging from $11.7 million to $28.8 million. The combined production cost benefits to Mountain West from two studies are in the range of $25.7 million to $99.8 million. After synthesizing the results of all the studies, the Mountain West participants determined that SPP RTO membership has the potential to provide significant benefits for customers due to combining reliability and markets. On September 22, 2017, the Mountain West participants announced they were beginning final negotiations with the Southwest Power Pool (SPP) for regional transmission organization (RTO) membership. The addition of MWTG would reduce the budgetary Schedule 1A rate for 2020 from $0.48/MW-hr to approximately $0.43 with transitional phase-in. Schedule 1A savings to existing members of SPP would be $16-$25 million annually for the first 3 years and over $150 million NPV for the initial 10 years of MWTG membership. Analysis of other quantifiable costs and benefits include APC, Contingency Reserve Sharing, Reduced PtP Revenue, DC-Tie cost allocation, and load diversity resulting in additional 10-year NPV benefits to SPP of approximately $50M. Total quantified 10-year NPV benefits net of expected costs to existing SPP Members is approximately $209M. Prior to going to the Members Committee and Board, SPP will be presenting changes to Governing Documents for approval using the SPP stakeholder process. SPP will be conducting a reliability assessment of each MWTG member’s transmission system to ensure that each system satisfies SPP’s minimum reliability planning criteria. Any noted deficiencies will be addressed by the deficient party. Each participating entity will have a multi-step approval process involving some combination of executive, board of director, customer, city, state, and federal approvals. Ultimately, approval from the Federal Energy Regulatory Commission (FERC) will be required. PCI’s GenManager software platform is currently deployed with 12 SPP market participants who together, total 70% of ISO’s capacity. Over the past 15-years, PCI has developed a strong partnership with SPP which itself licenses the GenManager platform to validate settlement results prior to making them available for market participants. © Power Costs, Inc. 2019 | All Rights Reserved.